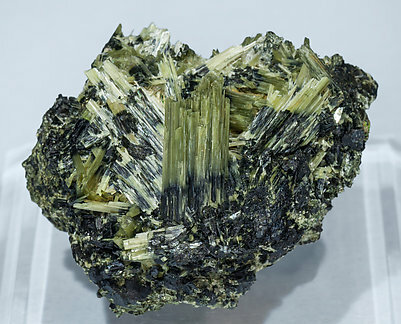 A Namibian novelty: in one area of the Namibian dessert, more or less due West of Uis, people found new Actinolites, very sharp and with a slight green tint, making the specimens more agreeable than others that are blacker. We got this specimen, which is a floater and complete on all its sides, for its luster and perfection. A novelty at Sainte Marie-aux-Mines 2018. 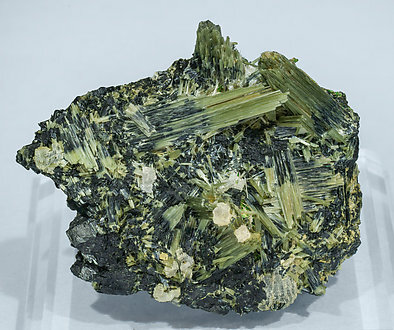 Bundle-like aggregates of acicular Actinolite crystals with a clear pistachio green color, with black intergrowths of crystalline Ferro-actinolite. Very original. The sample has been analyzed and we’ll send a copy of the analysis to the buyer. A novelty at Sainte Marie-aux-Mines 2018. 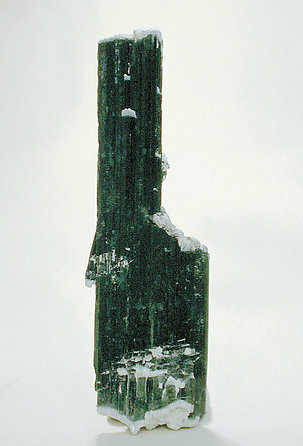 Bundle-like aggregates of acicular Actinolite crystals, one of them clearly dominant, with a clear pistachio green color, with black intergrowths of crystalline Ferro-actinolite. Very original. The sample has been analyzed and we’ll send a copy of the analysis to the buyer. A novelty at Sainte Marie-aux-Mines 2018. 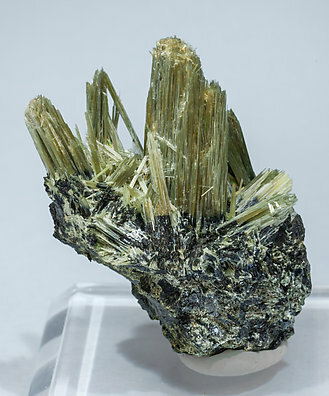 Bundle-like aggregates of acicular Actinolite crystals with a clear pistachio green color, with black intergrowths of crystalline Ferro-actinolite and white Prehnite crystals. Very original. The sample has been analyzed and we’ll send a copy of the analysis to the buyer. A novelty at Sainte Marie-aux-Mines 2018. 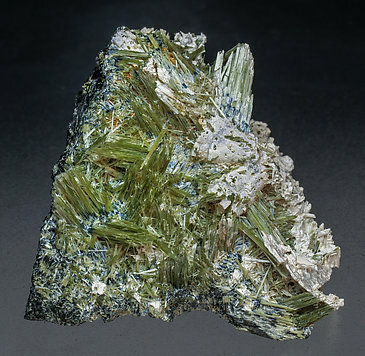 Bundle-like aggregates of fibrous and acicular Actinolite crystals with a clear pistachio green color, with darker, almost black, intergrowths of crystalline Ferro-actinolite and partially coated by white Prehnite. The sample has been analyzed and we will send a copy of the analysis to the buyer.